Traditional and original songs of adventurous women of North America, in English and French. How did she do it? How can I do it? A thousand years ago, Gudrid the Wanderer sailed in an open boat from Iceland to Newfoundland. In Columbus' lifetime, Marguerite de la Rocque gave birth alone on an island off the Quebec North Shore. Fur trader Lisette Laval paddled three thousand miles across the continent in a single summer in a birchbark canoe. In the days of the clipper ships, Eleanor Creesy set a world record around the Horn as the navigator of the Flying Cloud. Ida Lewis rescued dozens from drowning as the keeper of an island lighthouse. Mina Benson Hubbard charted the unknown Labrador in 1905. Sing along to true stories and let the lives of these remarkable women inspire your own adventures. 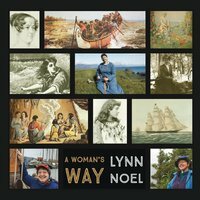 Geographer and adventurer Lynn Noel brings these unsung heroines to life as A WOMAN'S WAY takes you on a musical journey across North America by sail, rowboat, paddle, and trail.